This vacation property offers all the amenities of home. Majestic Mountain Retreat is a tri-level 4 bedroom 2 bath townhouse with two bedrooms and a full bath located on the upstairs and downstairs levels. The upper level has two bedrooms with one queen size bed in each room. On the lower level is the second set of two bedrooms with one having a queen size bed and the other having 2 twin beds. Also located on this level is a full bath and washer/dryer set. The ground level has a full kitchen with all your cooking needs, dining area and a full living room with cable television and DVD/VCR player. 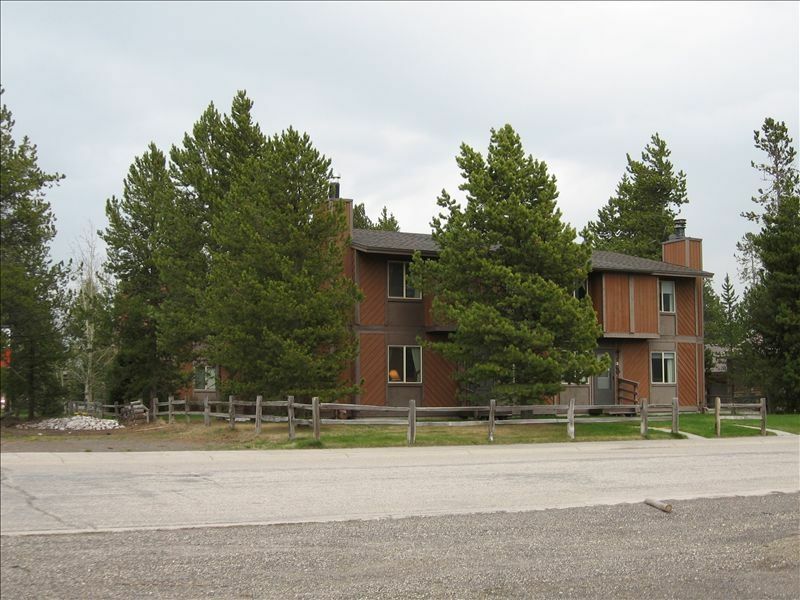 Our cozy townhouse is located on the western edge of West Yellowstone with a majestic view of the mountains along the continental divide. After a full day of sight seeing and wildlife viewing return to our spacious digs for a relaxing evening watching the sunset over the mountains. When retiring for the evening enjoy a movie or a good book in our living room or one of our four comfy bedrooms. The historic town of West Yellowstone, Montana is located directly west of Yellowstone National Park and has many interesting and historic features, shops and dining establishments nearby for your vacationing enjoyment. Majestic Mountain Retreat is located six blocks from the west gate entrance to Yellowstone National Park, four blocks from the Rendezvous Ski Trail system entrance and across the street from Gallatin National Forest and trails network. We would love to host your stay while in the greater Yellowstone area. Thank you for viewing our listing. Large kitchen table with 6 charis. We enjoyed our stay in condo in West Yellowstone. Condo location is perfect and very close to the West Entrance. We found everything what we need in this functional condo. Easy to contact to the owner as well. We recommend this condo for stay!! Our family had a great time. The location was so convenient to accessing Yellowstone. The unit had everything we needed. Having washer/dryer was a lifesaver. Nice views of sunset from the front lawn. It's located right on a main road so one hears trucks going by in the morning but if you are doing Yellowstone you'll be up early anyway. Downstairs bedrooms were very quiet. Very nice place to stay. Lots of room and very comfortable! It was great to have the washer and dryer available. Very close to Yellowstone entrance. Located near restaurants, store and shopping. We had a great stay! We very much enjoyed our stay here! The condo was clean and had all the conveniences of home. Our hostess thought of everything! It is very close to the entrance to the park and near restaurants and stores. Cancellation Policy is cancel 30 days or more and receive 50% of your deposit back. Cancel 29 days or less and loose your entire deposit.